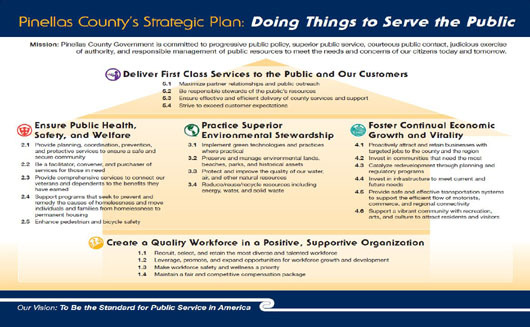 The Pinellas County Strategic Plan has been developed to enable the most efficient and effective use of public resources, provide the highest quality customer service, and create a supportive, rewarding work environment. The plan incorporates five strategic goals that reflect the elements of sustainability, align with our Values, and contribute to our ability to fulfill our Mission. Each of the goals is supported by strategies that align with and support the goal. While the Board of County Commissioners sets direction through goals and strategies, the “Things” (or tasks) that contribute to accomplishment of the strategies are carried out at the departmental level. Pinellas County is committed to high standards of quality service, respectful engagement, and responsible resource management. Every aspect of our strategic plan serves to fulfill these standards.